During World World II the Armed Forces in Australia were buying VEGEMITE spread in bulk, due to the product’s nutritional value. The company had to ration VEGEMITE spread on a per capita basis across Australia in order to meet the demand. This advert appeared, with the text shown below. Young Peter loves Vegemite… and his mother loves giving it to him… but he’s not getting so much these days, as his mother says: “It’s nearly all gone to Daddy, Peter.” And she’s right! The Vegemite is needed for our fighting men. So if you notice less Vegemite in your local shop, just remember that until we have won this war a lot of it will be going to the troops! Vegemite – the concentrated extract of yeast – the richest food source of the combined vitamin B1, B2 and P.P. (anti-pellagric factor). The food that helps keep the troops fighting. Click here to go straight to the Poll ! Read here about how Vegemite is made. Did you know that the company that invented Vegemite also invented Bonox? Yes, love it or hate it, I am a happy little vegemite. This song first aired on Australian radio in 1954 and then on television in 1956 and continued screening into the late 1960s. 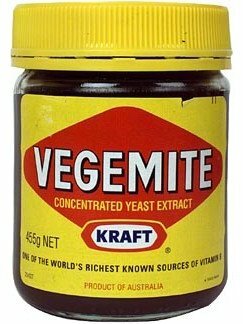 Along the way, I was born in September 1963 and yes, I was brought up on Vegemite (having arrived in Australia as a baby into an adoptive English-Australian family) !! The Primary School I attended in Australia was a delight to me on account of the wonderful tuck shop where delicious Matchsticks (cakes) were sold, and best of all – the most delightful delicious vegemite and peanut butter rolls – were sold to hungry small children. Vegemite was created in 1922 by chemist Cyril Callister, for Fred Walker of Melbourne in Victoria, Australia, because he wanted to develop a tasty and nourishing savoury yeast extract spread for his Fred Walker Cheese Company to sell. A national competition was launched to name the new spread, offering an attractive 50 pound prize pool for finalists. Unfortunately, the name of the winning contestant was not recorded, but it was Fred Walker’s daughter who chose the winning name – VEGEMITE – out of hundreds of entries. In 1902 the Marmite Food Company (later Marmite Ltd) was set up in Burton on Trent where it still resides today. The main differences between marmite & vegemite is that vegemite contains a malt extract made from barley, which is missing from Marmite, which has the stronger taste of the two; and Vegemite is missing Vitam B12 which is however, found in Marmite. Vitamin B12 is not naturally found in yeast, and is added to Marmite. 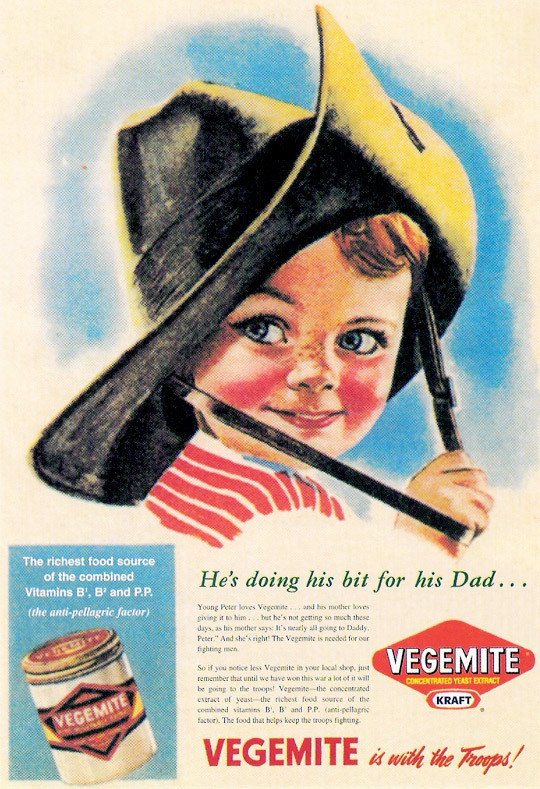 In 1935, the recipe and manufacturing methods for Vegemite were sold to Kraft Food. The Kraft Walker Cheese Company Pty Ltd was established in Melbourne in May 1926 as an initiative of Fred Walker who had been granted an exclusive license by the Kraft Cheese Co. (Inc.) of Chicago USA to use the Kraft patented method for the manufacture of processed cheese. Following the death of Fred Walker in 1935 the company was amalgamated with Fred Walker and Co. and the American Kraft Company acquired a controlling interest. In 1937 the Kraft Walker Company launched a promotion with substantial prizes – including imported Pontiac automobiles – asking people to create a limerick for the VEGEMITE brand. The promotion was hugely successful and saw a jump in VEGEMITE spread sales on a mass scale Australia wide. Unfortunately, the limerick was not recorded and is not known or remembered, as far as research can tell. In 1939 Vegemite received endorsement from the British Medical Association which allowed doctors to recommend it as a Vitamin B-rich, nutritionally balanced food for patients. In World War II, soldiers, sailors, and the civilian population of Australia all had Vegemite included in their rations. Soldiers’ Vegemite came in three sizes: seven-pound tins for the platoon, eight-ounce tins for soldiers on the go, and half-ounce rations for behind enemy lines. In 1952, for the first time, Kraft’s logo – a K in a hexagon – appeared on the VEGEMITE spread label. In 1972, a new advertising campaign for radio and magazines was launched, using the phrase, “Pass the VEGEMITE please.” It becomes a very popular turn of phrase. In the 1980s, with a song called “Down Under”, sung by the Australian rock band “Men at Work”, Vegemite came to the attention of people around the world, with the lyrics “He just smiled and gave me a vegemite sandwich’. In April 1984, a 115g jar of VEGEMITE spread makes supermarket history in Australia by becoming the first product to be electronically scanned at a checkout. It was scanned at Woolworths in Chullora, NSW and the price was 66 cents. The product is still on display at the Woolworths head office in NSW. 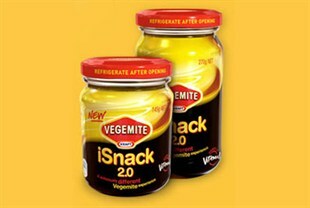 In 2009, a new VEGEMITE product combining vegemite with cream cheese was named iSnack2.0 after a nationwide naming competition. After the public expressed their discontent with the name, Kraft said it would clear about 500,000 iSnack-labelled jars through supermarket shelves, estimated to be about two months of supply, and then re-run the competition. Australian and New Zealand customers were offered 6 possible names and a popularity vote resulted in VEGEMITE CHEESYBITE for the new product. 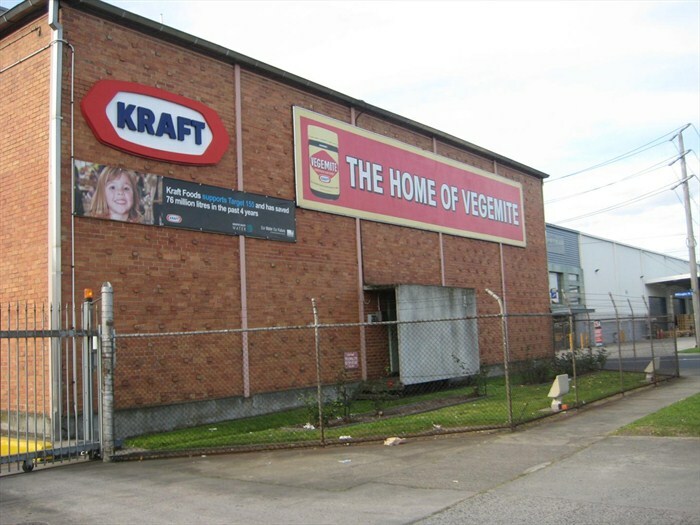 Vegemite is produced in Australia at Kraft Foods’ Port Melbourne manufacturing facility which produces more than 22 million jars per year. Virtually unchanged from Callister’s original recipe, Vegemite now far outsells Marmite and other similar spreads in Australia. The billionth jar of Vegemite was produced in October 2008. In the late 1980s the Kraft company was bought by a multinational company, Philip Morris, which then changed its own name to Altria in 2002. In 2007 Altria divested all its shares in Kraft Foods and the company that makes Vegemite once again became a fully independent company. In April 2007 it listed and started trading on the New York Stock Exchange as a global organisation with shareholders around the world. Following the global acquisition of Cadbury in 2010, the Kraft Foods portfolio includes 12 iconic brands with revenues exceeding $1 billion, including – Kraft, Jacobs, LU, Maxwell House, Cadbury, Trident, Milka, Nabisco and its Oreo brand, Philadelphia and Oscar Mayer and Tang. On Aug. 4, 2011, Kraft Foods announced plans to divide and create two independent public companies – a high-growth global snacks business and a high-margin North American grocery business. The transaction is expected to be completed on Oct. 1, 2012. If Vegemite was produced and marketed in the U.S.A. then probably many Americans would also grow up with Vegemite and love it. The story of Vegemite has travelled from 1922 to 2012, and 90 years later – Vegemite is now a global concern – made in Victoria, Australia, from the old recipe (with a little less salt), sold by an international confederate, but …….. LOVED, EATEN & TALKED ABOUT BY ……….. AUSTRALIANS !! We are happy little Vegemites as bright as bright can be! Categories: Culture, Food, History | Tags: australia, culture, food, kraft foods, vegemite | Permalink.